this is not the cat for you! These natural clowns adore their human friends. They are not a single person cat, but enjoy the entire family. Playful by nature, Japanese Bobtails like a good game of fetch, feathers and cat trees are a must. The old nursery rhyme, "Curiosity killed the cat, but satisfaction brought him back" applies here! If you’re folding clothes, a Japanese Bobtail will jump into the pile to make certain you do the job right. Japanese Bobtails are extremely intelligent and easily trained with praise and rewards. They quickly learn their name and what is expected of them. 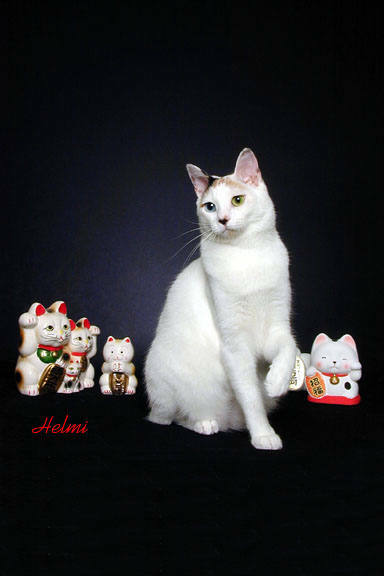 But like most cats, Japanese Bobtails will set their own obedience level! Newborn JBT babies are very developed with eyes opening soon. They are active from the first day, pulling themselves around the nesting box, responding to human voices. Longhairs and shorthairs - no difference in personality! Those who like the perky Japanese Bobtail personality but wanted a long hair, now can have both! Most first time Japanese Bobtail owners usually come back for another one! JBTS like other cats and are very social. Mine are raised with a German Shepherd, Lili Marlene. Pictured is GC Kurisumasu Tamamushi, lovingly owned & shown by Clare Rathbun when she was just 13. Tama lived a very long happy life with Clare.